Editor's Note: Many ideas that are associated with the United States -- such as free speech, or the separation of church and state -- are clarified by Supreme Court decisions. The Supreme Court also affirms one of the biggest ideas about the United States: that the U.S. is a country of laws, not of men. In other words, the legal system determines the rules everyone plays by. That means if you want to change something in the U.S., you have to change a law or fight for a law. In all the stories we tell in the following cases, someone did just that. A person thought something was not fair and took the argument to court. Over time, the case made its way to the Supreme Court. The justices made a decision about that particular situation -- and at the same time, defined the rules everyone in America lives by. 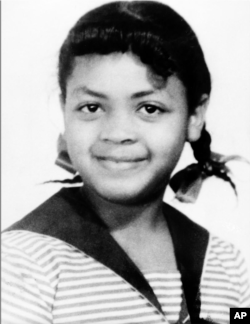 Linda Brown grew up to be a teacher, musician, and civil rights activist. At the center of the case was a little girl. In the early 1950s, Linda Brown was eight years old. Every day, she had to travel for more than an hour to go to a local public school for black children. At the time, public school systems could legally separate black and white students. The reason related to a Supreme Court decision from 1896. It said that separating people by race was legal, as long as the buildings and equipment were equal. But the father of young Linda Brown did not think racial segregation was right or fair. He wanted his children to go to the school close to their house, even if the school was for white children. When he tried to register Linda there, school officials said no. So Brown and other activists took action in court against the law. They said schools separated by race could never be equal. All nine Supreme Court justices agreed. Brown versus Board of Education demanded equal opportunity in public education, and in time led to desegregation in other public places.